Event 55 of the 2010 World Series of Poker was the $10,000 buy-in Pot Limit Omaha World Championship, where 346 players vied for a piece of the $3.2 million prize pool. 36 players would be lucky enough to take a share of the prize pool with the biggest winner earning over $780K and a coveted WSOP gold bracelet. The big champion was none other than Daniel Alaei, a 25 year old poker pro from Los Angeles, California, who won his third WSOP gold bracelet, and marked his 20th time to cash at the WSOP for $780,599. 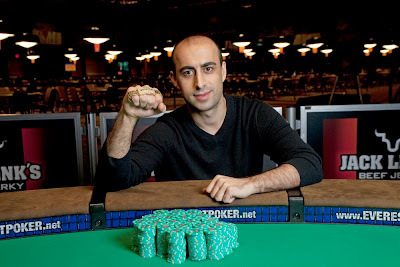 According to official records, Daniel Alaei now has three wins, five final table appearances, and 20 cashes at the WSOP. His career WSOP earnings now total $1,535,621. “It’s right up there. It’s really important to me. But they are all important. The first one, of course was special. The second one, too, because it solidifies the first one. And then the third one solidifies the first two. They all feel good. I want to keep on winning more,” says Daniel Alaei about winning his third WSOP gold bracelet. The runner up was Miguel Proulx from Saint Charles, Quebec, Canada, who collected $350,803 in prize money. The third-place finisher was Ville Mattila from Orimattila, Finland, who won $255,076. The fourth-place finisher was Ludovic Lacay from Paris, France who won $186,818. The fifth-place finisher was Trevor Uyesugi from Lethbridge, Alberta, Canada, who won $138,107. The sixth-place finisher was Stephen Pierson from Brooklyn, New York, who won $103,061. The seventh-place finisher was Dmitry Stelmak from Moscow, Russia, who earned $77,633. The eighth-place finisher was WSOP gold bracelet winner Alexander Kravchenko from Moscow, Russia, who won $59,020. The ninth-place finisher was Matthew Wheat from Dallas, Texas, who got paid $45,286. Former WSOP gold bracelet finishers who cashed in this event included – Daniel Alaei, Alexander Kravchenko (8th), Jason Mercier (10th), Phil Hellmuth (15th), Jason Lester (16th), Blair Rodman (18th), David “Devilfish” Ulliott (20th), Jordan Smith (25th), Nenad Medic (31st), and Fabrice Soulier (32nd). Tony Cousineau from Daytona Beach, Florida cashed again. He finished 14th. Tony Cousineau now has 46 career cashes at the WSOP -- which is the most of any non-gold bracelet winner in history. Phil Hellmuth finished in 15th place. He now has 79 career cashes and is the all-time in-the-money finishes leader in WSOP history.